If you exchange the counterfitting of money in Catch me if you Can, with hacking, you're pretty much got the sum of Takedown. Takedown is also a great film based on a true story, about infamous hacker Kevin Mitnick who was convicted to five years in prison in the late 90s, for "being able to start a nuclear war by whistling into a pay phone". Even though much of these claims have been proved to be true, the makers of Takedown were obviously not trying to make a 100% realistic portrayal of true events, but rather an interesting movie at the top of their capabilities. In this respect, they were more than successful. 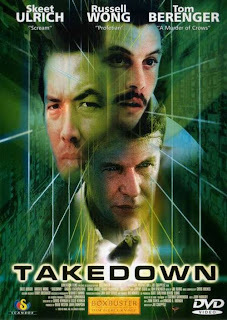 Takedown was wrongfully marketed as Hackers 2 when it came out, to cash in on the sorry excuse of a film that is Hackers. Rest assure that other than dealing with the subject of hacking, the two films are not at all similar.